Unlike many other models, the focus is not to dissect the psychological nature of individuals but rather their capability to interact, drive and lead the transformation of the organization from a sociological perspective. The orientation is pragmatic, and it is focused on the HOW and not the WHY of management and leadership skills. The premise is that the ideal executive does not exist. Our research indicates that there is no such thing as branding a person as an A, B, or Z type since the environment and context drive our behaviors. Great managers and leaders adapt, and their styles tend to change based on the challenge, and the strength and weaknesses of other members of a team. 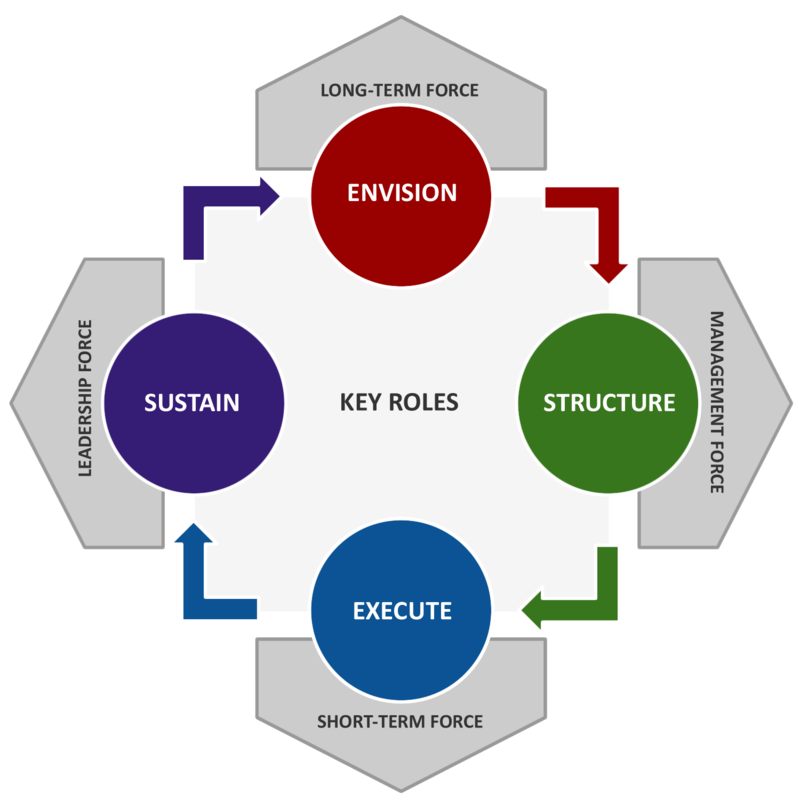 The Alder Koten Transformation Competency Model is based on key leadership and management roles, and how these roles interact under different circumstances to predict an outcome. 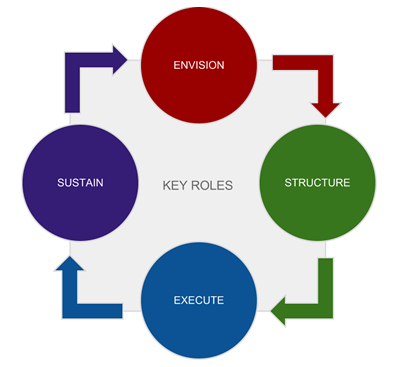 It identifies four basic roles that coexist and need to be performed in order to achieve a common goal and transform the organization. These four roles can be applied to our personal or work lives, and they can be applied to an individual, an organization, government, or culture. For any task at hand, we will envision what it is that we need to do, structure what needs to happen, execute to get it done, and set the right elements in place in order to sustain it. The way the roles interact is critical because while they are all required to coexist their nature is incompatible. 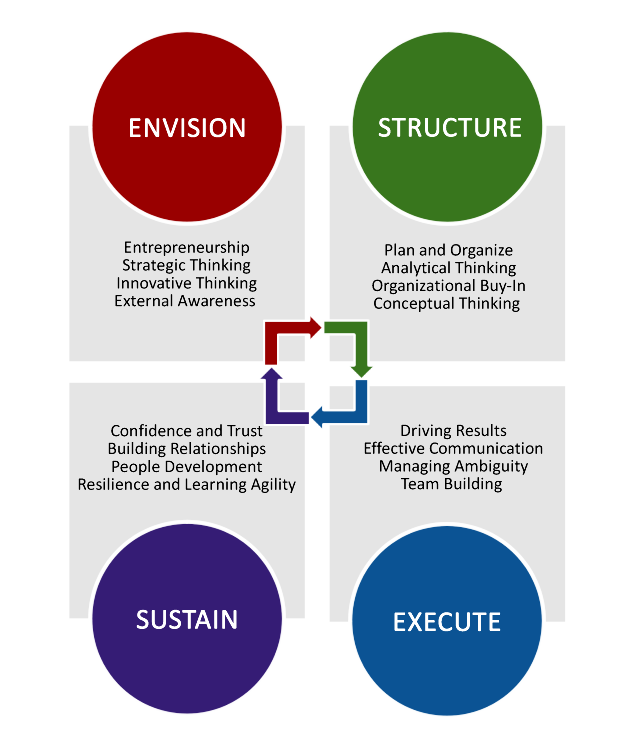 The Envision role requires us to think in the abstract, out of the box and focus on the long term. The focus allows us to look ahead, identify threats, and think about what is required to be effective in the future.The behavior is conflicting with the Execute role that is the discipline of getting things done and requires a strong focus on what is required to be effective now. As these two behaviors coexist they provide opposing forces: One focused on the long-term and the other on the short-term. Without the opposing force, the strong Envision profile would only be a dreamer that never gets things done while the Execute profile would be living day-to-day in an endless reactive cycle. The Structure and Sustain roles share a similar symbiosis. The Structure role provides a highly systematic approach in order to be efficient in the short term. It’s focused on planning, and establishing efficient procedures and structure. It forces ambiguity out to provide efficient and predictable management. In contrast, the Sustain role focuses on nurturing adaptability, and guaranteeing that systems remain diverse and productive over time. It challenges the rigidity of the Structure role to be efficient in the long-term. As these two behaviors coexist they provide opposing forces: One focused on leadership and the other on management. The manager protects the status quo; the leader challenges it. These conflicting differences could be traced to physiology according to the left-brain, right-brain dominance theory, the right side of the brain is best at expressive and creative tasks (Envision – Sustain). The left-side of the brain is considered to be adept at tasks that involve logic, structure, and analytical thinking (Execute – Structure). Although a lateral dominance is measurable, both hemispheres contribute to both kinds of processes, and experimental evidence provides little support for correlating the structural differences between the sides with such broadly-defined functional differences. Evidence in management and leadership suggest that while the nature of the roles is conflicting we are fully capable of switching from one role to another at any given point in time depending on what is required. However, given the conflicting nature, no one can excel at all of the roles at the same time, in every situation, and under every context. Anyone may excel in one or more roles, but if any one of these four roles is missing, or if one is overpowering, a pattern of mismanagement or misalignment may occur. Good leaders and good teams must seek a balance and be fully capable of performing each role.